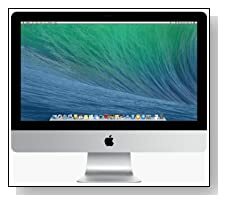 iMac MF883LL/A is the latest 21.5 inch Apple All-in-One desktop- released in June 2014 with a 1.4 GHz Intel Core i5 processor, 8GB RAM memory, 500GB hard drive and Intel HD 5000 graphics card. So what has changed since the previous low end 21.5 iMac desktop is that the hard drive is half the size, processor is a slower dual core i5 that is available on Macbook Air, graphics card is downgraded from Iris Pro and of course it is cheaper. It will still be fine for most day-today tasks but not so much for demanding things like photo and video editing and games. Let’s see if this new model is worth considering for the price difference. The mid-2014 Apple iMac comes with a dual core Intel i5-4260U processor (3MB Shared L3 Cache) at 1.4 GHz base speed that can go up to 2.7 GHz with turbo boost, 8 GB of LPDDR3 SDRAM at 1600MHz for successful multitasking, 500GB SATA HDD at 5400rpm rotating speed as adequate storage space for your files and the latest OS X Mavericks that can be upgraded for free to OS X Yosemite when it is out later this year. You also have the iCloud wireless service to be able to use your iPhone, iPod, iPad and iMac smoothly together. The i5 processor has a U at the end which stands for ‘Ultrabook’ and can be found commonly on ultra books and Macbook Air. This doesn’t mean that the new iMac desktop isn’t a great performer, in fact it is if you’re going to use it for your daily tasks and not much for memory intensive and demanding tasks. The size of RAM stays the same and gives you the ability to run a few browsers and apps simultaneously. In one of the speed tests by MacWorld Lab, the newest iMac is 54% slower than the previous entry model- ME086LL/A. Not much has changed in terms of display and image quality though. You still have the 21.5 inch diagonal LED backlit Full HD IPS widescreen display with very large viewing angles and is only 5mm thin at the edge, with1920 x 1080 pixel resolution but the Intel HD Graphics 5000 instead of the Intel Iris Pro 5200 Graphics. Even though you see very sharp picture with true-to-life and vibrant colours, reflection is decreased by about 75% with the full lamination and antireflective coating. Sound is still quite immersive and amazing and although the speakers are underneath the screen, it doesn’t feel like the sound is coming through the bottom. Webcam is the top of the range FaceTime HD camera with built-in dual microphones that allows you to take perfect still photos or video chat with people- for fun or work. In terms of connectivity, the new iMac has the same super fast 2 x Thunderbolt ports that is 20 times faster than the standard USB 2.0, 3 x USB 3.0 ports that are backward compatible with the USB 2.0 but also enable 10 times faster data transfer, the latest 802.11ac WiFi for the fastest wireless internet that covers the widest range, Gigabit Ethernet for wired internet connection, Bluetooth 4.0 connectivity, SDXC Memory Card Reader, English Apple Wireless Keyboard and Apple Magic Mouse. The new iMac weighs 12.5 pounds and has the measurements of 6.90 x 20.80 x 17.70 inches (just like the late 2013 models). Conclusion: The all new iMac MF883LL/A is roughly $200 cheaper (as of the date of this review- 2 July) than the previous low end 2.7 Ghz iMac ME086LL/A and for only $200 you’ll have to give up on a much faster quad core processor, twice the size of hard drive, faster and more advanced Intel Iris Pro graphics card. Everything else stays pretty much the same. Is it worth it? Well, this will come down to your personal preferences. If you will be using the computer for surfing the web, word processing, playing the lighter games and that sort of stuff and still want an Apple computer, this one sure is a good one.. ..But for a small price difference you’re giving up on more than 50% overall performance boost and much bigger storage space. Even if you were to purchase the new iMac with a Fusion Drive, the performance boost would be 20% and still slower than the iMac ME086LL/A model although it would work out to be more expensive. 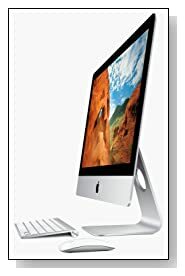 So get this one if you don’t want to spend an extra 200 something dollars and want a Mac for basic everyday tasks, and not if you will be editing videos and playing more advanced games, and go with the late 2013 entry model 2.7 GHz iMac ME086LL/A.